Other Destinations is curated from the Polk Museum of Art permanent collection and celebrates the allure of “somewhere else.” Formed as a counterpart to the current major exhibition Destinations in Paintings: The Kasten Collection, this exhibition highlights a contemporary critique of experiencing some new place or escaping our daily environments for renewal in some foreign space. Most artists these days do not approach a destination strictly based on its aesthetic qualities. Unlike 19th-century academic landscape painters who relished in the natural beauty of a site, modern artists more often examine the surrounding context of a location, allowing that to form the visual landscape. This isn’t to say neither they, nor we modern viewers, do not acknowledge and appreciate the unique physical beauty of another place; we usually flail in the serenity provided by such beauty. But as our world grows increasingly smaller, it doesn’t always seem enough to marvel at a place’s objective beauty; there are nowadays subjective and unseen qualifiers that play in our full understanding of an inspiring destination. The artworks included in Other Destinations are perhaps less literal and in some ways less lyrical than those romantic paintings from the academic tradition. Many of them contain a cerebral interpretation of a destination, or are perhaps visual commentaries on the society or culture of a specific place. In its characteristic tradition, modern art represents a world that no longer needs to be literally represented and inhabited; modern destinations must be contextually experienced, not geographically explored; understood according to their diverse social and cultural climates. Other Destinations provides that contemporary compliment. Alex and Barbara Kasten have been collecting art for decades. This exhibition celebrates one of their most cherished collecting focuses: 19th-century academic painting. These 33 works of art, dating from the 1860s to the 1920s, represent the breadth of the Kasten Collection and offer audiences the opportunity to see a past era through the paintbrushes of 28 distinguished artists from England, France, Germany, and Austria. This collection was assembled by Mr. and Mrs. Kasten with the guidance of the Kurt E. Schon, Ltd. Fine Art Galleries in New Orleans. Above: Henri Duvieux, Venise, ca. 1882-1884, Oil on canvas, Alexander & Barbara Kasten Collection. Telegram confirming that the Moon Museum was secretly placed on the Apollo XII lander. Following the triumphant return from its blockbuster U.S. Department of State and National Geographic-sponsored presentation last year at the National Gallery of Art in Tbilisi, Georgia (former Soviet Union), Polk Museum of Art will give Central Florida visitors the exceptional opportunity to view “in-person” the first-ever “Space Art” object . Presenting the little-known Experiments in Art & Technology (E.A.T.) project that clandestinely sent and permanently sited original artwork by six renowned American artists on the lunar surface, The Moon Museum (1969): Apollo XII’s Secret Art Mission is curated by Jade Dellinger in partnership with the Bob Rauschenberg Gallery at Florida SouthWestern State College. Inspired by the success of the Apollo XI mission and wanting nothing more than to put something soulful up where typically NASA had left detritus and hardware behind, the Moon Museum was the brainchild of New York sculptor Forrest “Frosty” Myers. Inviting a group of the most significant artists of the time including John Chamberlain, David Novros, Claes Oldenburg, Andy Warhol and Bob Rauschenberg to join him in contributing individual drawings, Myers collaborated with engineers at Bell Laboratories to transfer their images (using a then cutting-edge photo-reduction technique developed for micro-circuitry) onto a handful of identical postage stamp-sized, paper-thin ceramic wafers. The first-ever art object to travel into space, one copy of the Moon Museum multiple was surreptitiously attached to the Apollo XII lunar landing LEM 6, and has, without the knowledge or approval of NASA, resided on the surface of the Moon for more than forty-five years. Nearly a half century later, the Moon Museum (with drawings by Rauschenberg, Chamberlain, Oldenburg, Novros, Myers and Warhol) is still a compelling art object and continues to resonate profoundly in the imagination. For the first time in Central Florida, The Moon Museum (1969): Apollo XII’s Secret Art Mission will present one of the few known original Moon Museum ceramic multiples along with vintage NASA press photographs, film shot by Apollo XII astronauts and related mission-flown artifacts. The western tradition of printmaking began as paper became widely available around 1400 CE. The art form had been prevalent in the East for centuries, but its introduction to Europe bolstered its identity as a serious but accessible medium. In many ways, printmaking was even considered an acceptable alternative to painting. Printmaking allowed multiple images to be produced quickly and economically, which raised its status among artists and collectors alike. The most influential of the early European printmakers was Johannes Gutenberg, who in the mid-15th century invented moveable type. Gutenberg’s innovation standardized the production of printers’ plates. Artists soon adopted Gutenberg’s process and adapted it to create highly complex visual compositions, or impressions. The first techniques of fine art printmaking to become popular in the west were from the intaglio family, including woodcuts, engravings and drypoint printing. Renaissance masters like Albrecht Dürer, Hans Holbein and Annibale Carracci, who were all also celebrated painters, were considered some of the most ardent and proficient intaglio printmakers. Their experimentation further modernized Gutenberg’s initial work and distinguished fine art printmaking from the popular moveable type. As artists continued to experiment with printmaking, new processes were discovered. Lithography, screen printing and monotypes eventually led to the more modern digital print. The common denominator of these varied printing techniques is the use of ink, not paint, to produce an impression. Most of the celebrated printmakers throughout art history were also, and in many cases foremost, painters. Printmaking was an opportunity for these painters to produce a series of works that were less intensive to create and more affordable to a wider range of collectors. Printmaking continues to grant painters the freedom to create unique and beautiful works of art without the limits and time consuming methods of painting. This exhibition of works from the Polk Museum of Art permanent collection celebrates the modern print as the unpainting, or that distant cousin to traditional painting that has found its own respective voice in the discourse of art making and art collecting. Tinia Clark (Winter Haven) and Gregory Jones (Lakeland) are award-winning artists whose works have earned them a local following. Clark, a native Floridian, initially studied under local noted artist Elizabeth Clement, but soon discovered her own expressive style. Jones, a Virginia native, has been a staple on the local arts scene for decades and has made himself a regular exhibiting artist at art festivals throughout Florida. Works by these two artists will be celebrated in an exhibition focused on the duality of abstraction. Traditionally, abstraction has been defined as an artist’s personal style of restructuring recognizable subjects into something visually different. The main point being that abstraction has roots in nature; in order to abstract, an artist must begin with a physical subject. However, abstraction has come to also describe expressive works of art that have no allusion to a natural subject. This form of abstraction is often also referred to as non-objective. Works by Clark and Jones represent both sides of abstraction: Clark’s more non-objective formal compositions contrast beautifully with Jones’s more traditionally abstracted subjects. African American Art Since 1950: Perspectives from the David C. Driskell Center, an exhibition in which works by renowned artists such as Romare Bearden, Elizabeth Catlett, and Sam Gilliam are coupled with exciting new visionaries, including Chakaia Booker, Lorna Simpson, and Kara Walker, collectively reflects the growing prominence—and complexity—of the field of African American Art over the last 60 years. The exhibition is organized by the David C. Driskell Center for the Study of the Visual Arts and Culture of African Americans and the African Diaspora at the University of Maryland. Over thirty-five years ago, when prominent artist, collector, and scholar David C. Driskell developed the 1976 exhibition Two Centuries of Black American Art: 1750-1950, organized by the Los Angeles County Museum of Art, he introduced the tremendous depth and breadth of African American art and creativity to an international audience.African American Art Since 1950: Perspectives from the David C. Driskell Center, curated by Dr. Robert E. Steele and Dorit Yaron, the David C. Driskell Center’s Former Executive Director and Acting Director, respectively, and Independent Scholar Dr. Adrienne L. Childs, honors the legacy of this landmark exhibition and brings to the nation the next pivotal chapter of African American art. African American culture is embedded in a rich and complex history. It is impossible to deny the influence African American culture has had on the progressive nature of the American condition or how it has profoundly shaped the modern American identity. It has assisted in exposing the murkiest corners of American history while helping to reform our collective consciousness as we mature into that proverbial American melting pot. African American culture is a profound part of the shared American culture that goes much deeper than the color of skin. Contemporary African American artists contribute to the growing lexicon of their unique culture as it becomes ever more tightly fused with the American spirit. Artworks and the associated commentary made by these artists prove impactful on our perpetually evolving social environment. They keep the past evident and preserve those important pieces of a past that we do not boast. But, they also celebrate cultural heritage and inform the forward motion of contemporary American society. 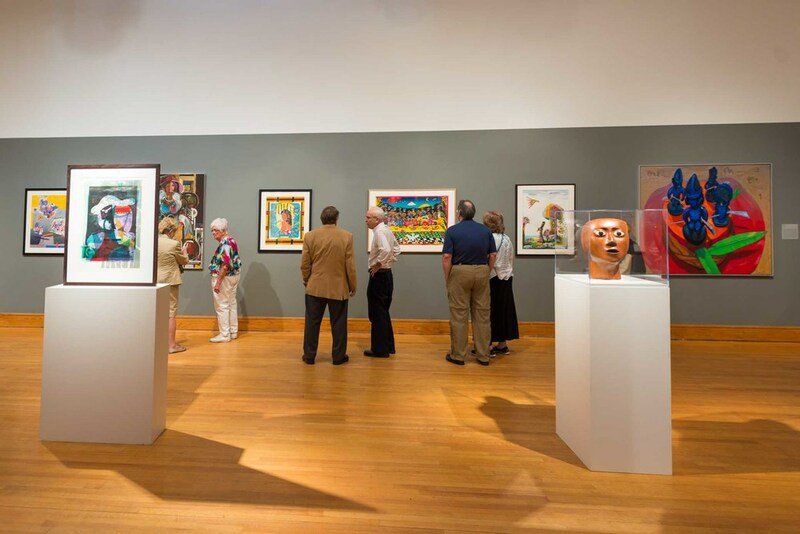 As an addendum to the anticipated exhibition African American Art Since 1950: Perspectives from the David C. Driskell Center, Polk Museum of Art celebrates African American culture by presenting a sampling of works from its Permanent Collection. 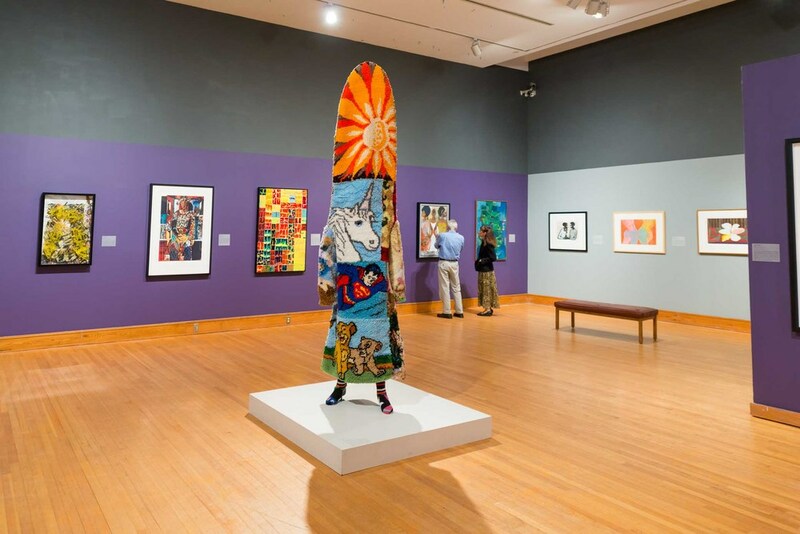 Works by contemporary African American artists are mixed with traditional objects from Africa to provide a well-rounded understanding of a resonant and constructive culture. In 1970, British veterinarian and writer James Herriot published his first of two novels chronicling his experiences with animals and their owners. If Only They Could Talk is a semi-autobiographical anthology of stories from the perspective of a young 1930s vet. Although animals are most often the protagonists in Herriot’s stories, his underlying theses are how we as humans are ultimately conditioned by our animals and how our relationships with our pets often say more about us than they do about the animals. It only makes sense that we are influenced by animals. It has been programmed into our collective unconscious for millennia. Beginning in the Paleolithic era, prehistoric artists painted herds of animals along cave walls. It is speculated that these primitive paintings were intended to celebrate, or perhaps worship, animals’ important contributions to human survival. Although their creative objectives have evolved alongside civilization, artists continue to use animals as primary subjects for their works. In this exhibition, artworks from Polk Museum of Art’s permanent collection are displayed according to their focus on our animal cohabitants.